FAG bearing is the one that was removed, SKF is the new bearing. you'll just about see there's a shoulder on the shaft to position the bearing. 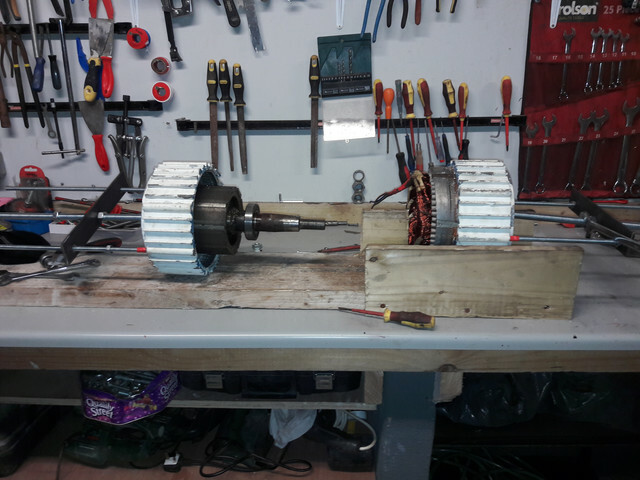 there's a similar one at the rear so in effect the bearings hold the shaft in position and the bearings are in housings in the casings. the extra bearing ?, it was kind of packing against the back of the shaft to stop movement without restricting the rotation. If i want to put this up and forget about it then that sound like a good idea. say we've had any really serious winds in the last few months. Im also counting on the smaller blades helping. I think in this case it must the a bearing problem as i know from the 1kw turbine i have, that these turbines can take regular storms without problems. im more than willing to look at other types of bearings, but i dont know if theres many options in this size. Good to see the one on the right. I don't recall an extra bearing but I am running a very heavy spring loaded plastic stopper that is packed with grease and is pushed in the hole at the rear. There is just enough give in the spring ( 60mm of bullwire) to stop the lateral thrust from landing solid. Does it make a difference. ? I believe that it does.+ I have a spare one if you need it and a yaw set wit a double set of brushe's as a stalk stabaliservices already fitted. I will go down to the shed and check and switch my laptop. I went to my bung holder and I must have used the last one but they are not hard to find in Ms. The bung is approx 40mm wide on the insert with ribs that extent and grip the sides of the opening. the mushroom head is approx 50mm in diameter so a grove is tracked in the head and the bullwire spring is shaped to slot into little holes in the side of the entry flange and the spring is levered across the cap jnto the groove, The insert part of the bung is cut so that it just touches the rear of the shaft. Then it is packed with grease and the lot forced into the hole and the spring fitted. It is a very basic idea but I think it works very well, No strange clonking. 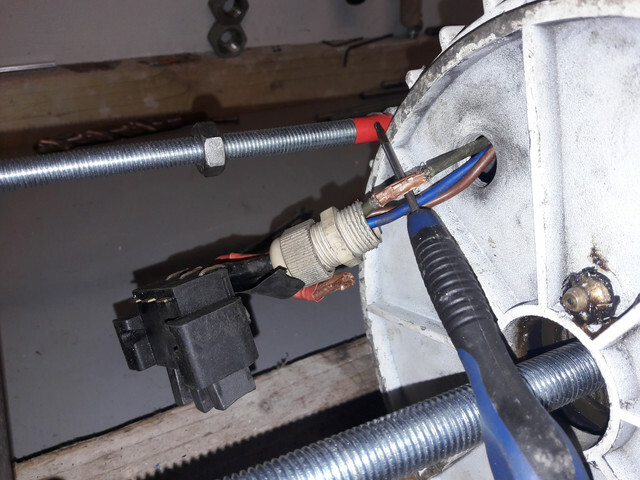 You will note that the brush stabalising stalk is not fitted to that brush set but i have the arm and the necessary insulators and fitting is simple. I'd be very interested in that yaw set, looks like a vast improvement on the existing. Ill give you a call before the weekend. Were you getting the 'clonking' all the time or just with worn bearings ?. i might as well add the rest of the photos. i the tightened each of the outside bolts in turn and the two sections began to part, really easily. chisel to really get them moving apart. on the end of the rod to turn the rod. Once the two halves were this far apart there was no magnetic force between them, but i had the same problem as last time. The windings had stuck to the front case rather than the rear case. Its only a problem because you cant separate them fully due to the cable for the brushes feeding through the rear case. So there was no way to remove the core without cutting off the brushes, again. would pass thro the hole was to crimp some microbore pipe. the three cuts were staggered. the outer two could have been done afterwards, but there were other cable repairs nearer the core. so i crimped them all, used adhesive shrink wrap and tape. time to cut the cables again. i think the reason the case was so difficult to split last time was that the windings were bonded to the rear and possibly corroded to the front and i ended up breaking the adhesive bond. i cant see how you can control this as the side with the least resistance seems to give. magnet and im sure its possible to hurt yourself or damage the magnets, last time i wrapped it in a thick cloth, probably should have done the same this time. The windings look very good, no damage which was the main worry. I did pack some of the cables with heatshrink last time as the strings were cutting the wire insulation. The bearing housing was also undamaged, i was worried that the last time i put it back together i could have damaged the housing. but i can see now its more substantial than i remembered. The final thing i did at the weekend was to remove the front bearing, which was easy enough once you get used to only having two hands for a three handed job. And thats as far as ive got so far. Hi T.well done. Great pics. The clonk would happen a split second after furling. I would stand with my hand on the tower base and feel this odd sound. (I feel sound). In wicked weather it was quite destinctive. It has never happened with the Bung in place. It is not a nice feeling knowing that the lot could be shifting back and forth. I knew the bearings were not moving on the shaft and I had greased the seats for easy assembly. Those new bearings are sealed for life but I always put a good shot of grease in around them.Red gear. I have come out a morning after a dinger of a storm and found that the old brown grease had melted and streaked the sides of the casings black with the heat from the motor.The red stuff don't run the same. Give us a shout before you land. To be sure I am not in Paris or New York or even Able Dabble . I get around you know.. But still time to lower. The wind just dropped for an hour or so ,enough for me to lower mine. In fact there is a pretty bad blow all over. Thanks Biff, i left the 1kw up, im sheltered to the south so i cant see it been to bad on my site. a paltry 7mph from the east just now. Just a Breezy day here , so far. We are supposed to be getting hammered right now. There is a nice force 6 going but that's about it. Me thinks I could be speaking too soon. And I had. It's a ripe old storm out there now with the winds coming in from two directions. Our turbine is taking off in fits and starts. The map shows direction from the south west but the turbine needs the North west when it is down. I should have tied the blades. Yes, it certianly turned nasty on friday night, just when it looked like the worst was over, the 1kw seamed to sail through it tho. Ive no real progress since as im waiting for an SKF bearing which is on order, most of the suppliers around here are stocking just C3. It seams the general use is for motors and C3 is really better. It’s highly likely that the knocking noise that you describe is due to the amount of play in the bearings. 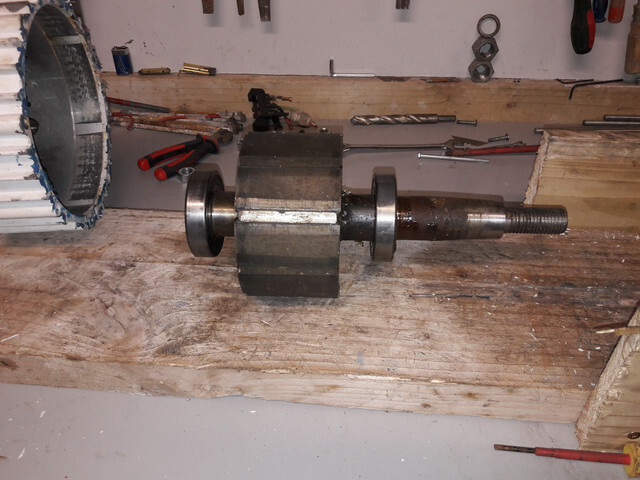 The aim is to have the minimal amount of play and this is dependent on the shaft/housing fit – if you can provide these to me, I can run a quick calculation to check but it might be that a bearing with CN clearance will resolve the issue, rather than a bearing with C2 clearance which will be much harder to get hold of. Yes, angular contact ball bearings is also a possible solution or spring preloading of the ball bearings. See how you get on with CN and we can help further, please let me know. I see now that the angular bearings are ref 7208 (instead of 6208). So my next decision is whether to order some. Ive no doubt the standard clearance bearings are 'good enough', but given my habit of leaving the turbine up in all weather its probably worth a try. Has anyone any experience of angular bearings ?, the last time i tried to 'improve' things didnt go so well. 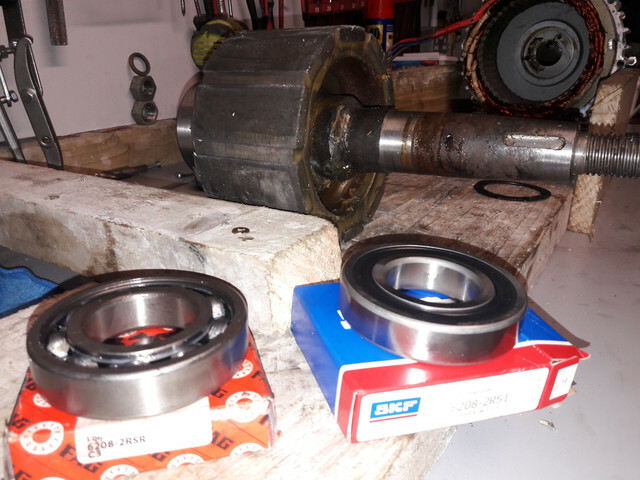 I accidentally tried some SKF C3 bearings on my hydro generator(~900-1000 rpm, lukewarm at most)- i ordered them off that well know auction site without noticing the C3 designation 'til they arrived. I googled it at the time and got the impression they were intended for high temperature running - hence they were looser when cold. Anyway, I put them in and they didn't seem to last very long so the next time I made sure I ordered standard.